1. DON’T GET LEFT OUT IN THE COLD. A kitchen remodel is the perfect time to install brand new flooring, so why not take the opportunity to include underfloor heating too. It’s energy efficient, as heat spreads evenly throughout the room from the ground up, and always adds value to a home. Plus, there is nothing quite as cozy as stepping onto a heated floor in the middle of winter. A wood burning stove is an excellent option if you’re not digging up the floor in your kitchen remodel. Always check the chimney too, along with the filters in a heating system, as cold weather creeps in. You must make sure your home’s windows are ready for winter weather, and the kitchen windows are no exception. Even the tiniest gap in a window is going to make the wind whistle through your kitchen. The best thing you can do is upgrade the windows as part of a new kitchen design. Otherwise, replace cracked window panes and seal up problem areas. Lighting is more important during the dark days of winter than any other season. Dust and clean all your bulbs and lamp shades so they sparkle and shine. The finishing touch to any kitchen remodel is to make sure the lighting compliments your kitchen design. Layer your approach with strong task lighting alongside softer pendant and mood lighting. Fixtures in warms colors and materials will also warm up your design. 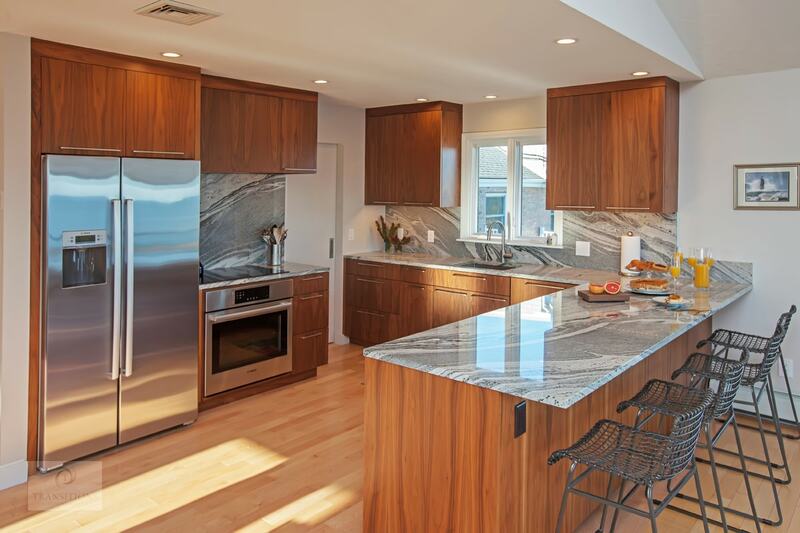 The layered lighting design, along with gold metal and rich browns, gives an amazing glow to this South Hanover kitchen design. This is a good time to defrost fridges and freezers, so you can give them a thorough clean and re-stock with winter goods. Try to make extra soups and casseroles so you can freeze them in anticipation of busy, dark evenings. 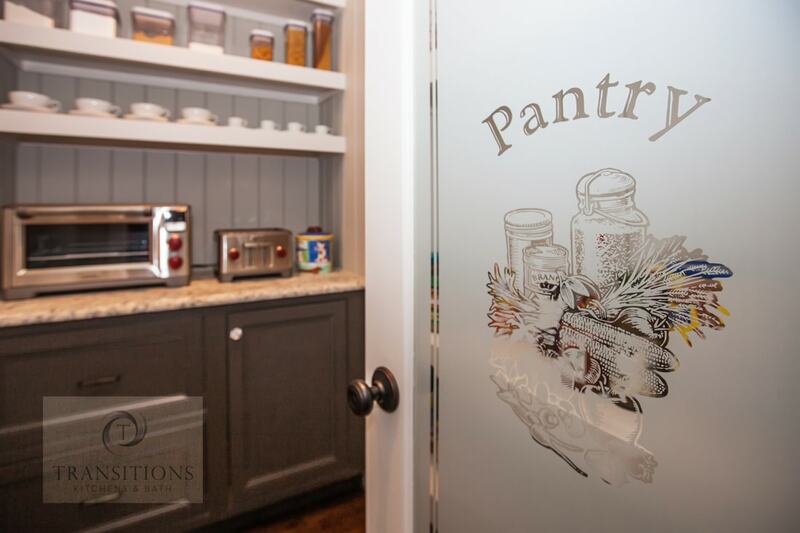 Organize your recipes according to seasons and have what you need at hand. Bring out mugs, blenders, roasting tins, crock pots, and other items you are more likely to use in winter. You’re now ready to cater for coldness and hunger pangs! Rugs and runners are an easy way transform a floor, but have you thought about putting carpet in the living-area of your kitchen? Tiles and natural stone conduct heat well so are perfect for underfloor heating. 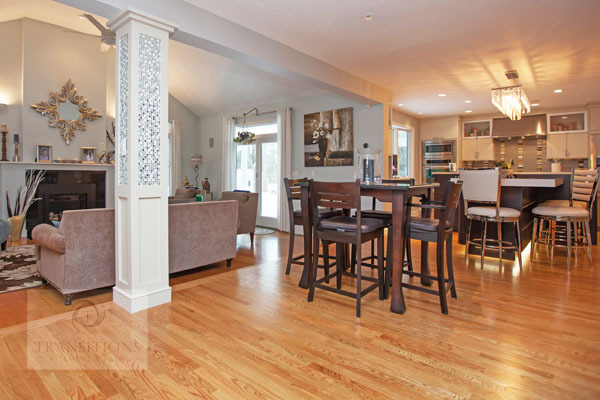 Hardwood floors need care but they’re worth it for the high-quality finish and are a naturally warm surface. 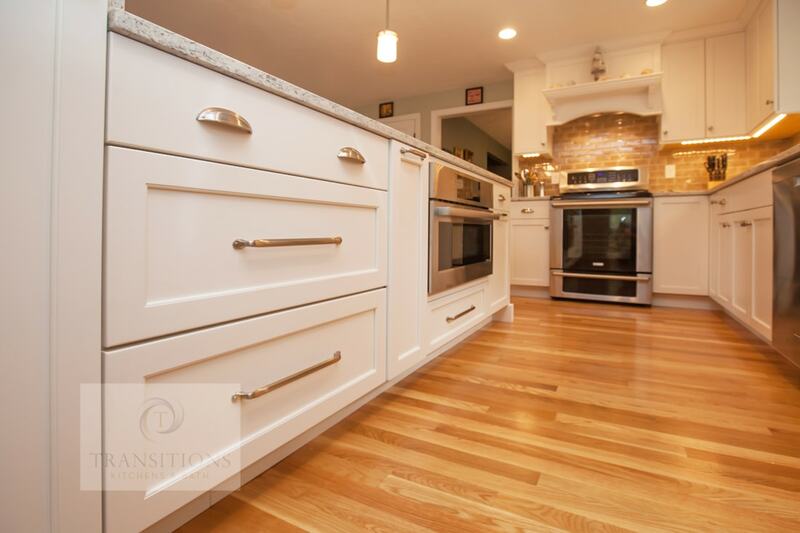 Check out the hardwood floor, which brings warmth and depth to this Cohasset kitchen remodel. 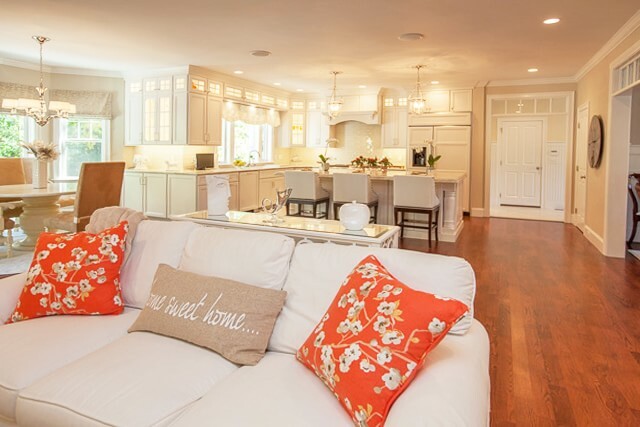 Color is so important when creating a warm kitchen design. A statement wall in a rich or fiery tone can create a cozy corner. If your design is minimal, why not go for brightly colored cabinets and accessorize with warm metals or wood accents? Dark colors, such as velvety brown really stand out against white finishes to make your kitchen design crisp but luxuriously warm, just like hot coffee in a white porcelain mug. 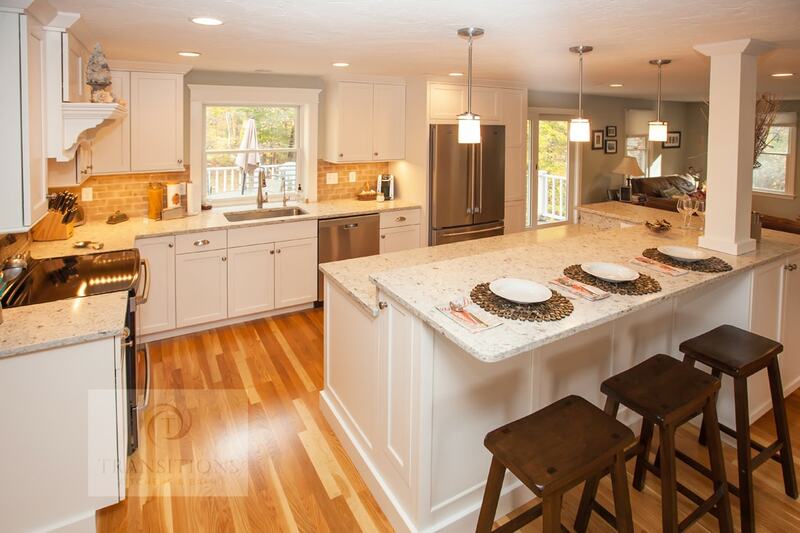 The dark brown countertop in this kitchen design in Norwell is the perfect contrast to the white kitchen cabinets, and along with richly colored accessories really warms up the kitchen design. When the weather is bleak outside, bring in items in colors, textures and scents full of depth and richness. Add warmly colored cushions, oven mitts, table cloths and dish towels. 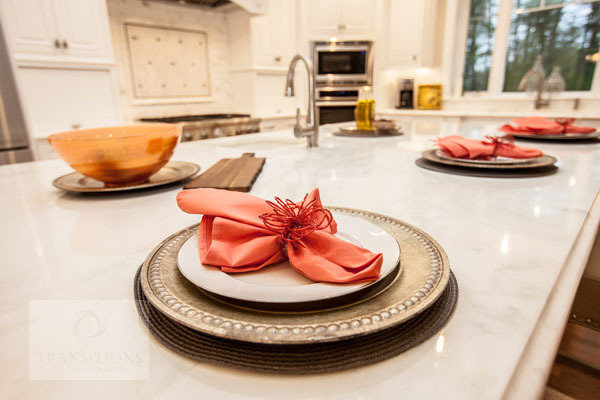 Place bowls of seasonal items like pine cones, fruit or nuts around the room. Treat your senses with spicy candles and woody herbs on your windowsill. Lastly, embrace the festive season with cheery tableware to welcome friends and family into your home. Your kitchen design is the heart of your home and responds well to a little love and inspiration taken from other rooms to make it cozy and multi functional. Make it a place you want to relax, work and entertain in. 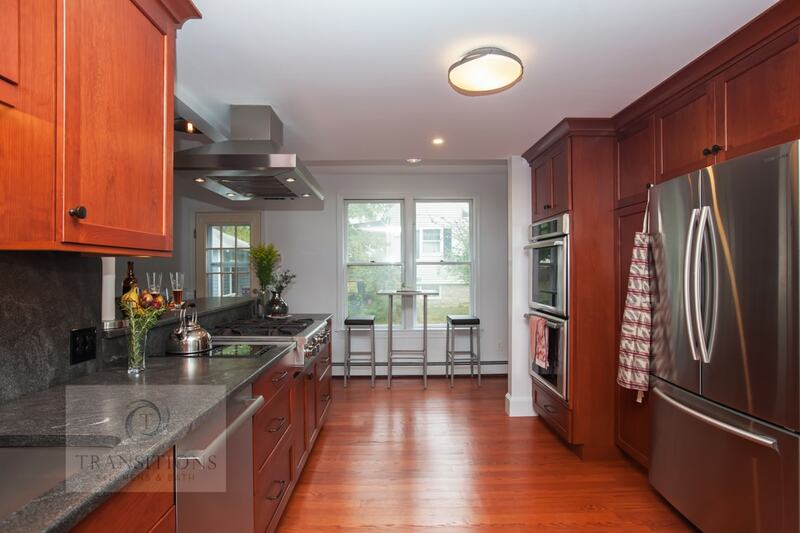 Check out our kitchen remodeling gallery for further ideas or talk to our kitchen design experts about the how to get started on your dream kitchen remodel.